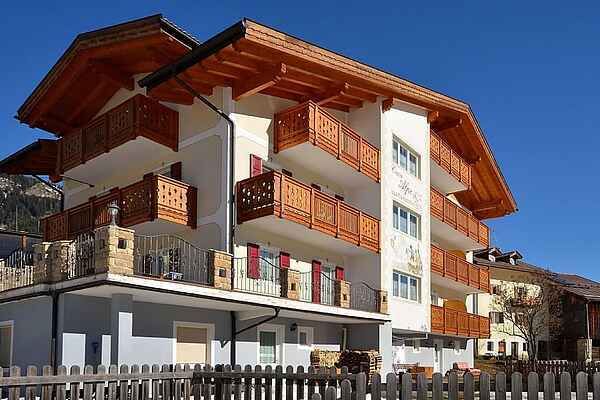 Kept and comfortable apartments in a quiet and sunny overlooking a beautiful alpine panorama, just 2 minutes from the center of Vigo di Fassa and in the immediate vicinity of the lift of the Rosengarten. Ideal for families with children who want to spend their summer and winter holidays in Val di Fassa; in addition to the private garden and a special room for children, a short distance away is the playground pubblico. At guests' disposal also a fully equipped gym and a relaxation area with sauna and turkish bath (included in the price in winter, extra on request in the summer season). The apartment is on the second floor with two balconies, one facing south and one west with table, chairs and clotheshorse. It consists of two double beds which can be eventually separated. Plasma TV, DVD player, kitchenette with ceramic glass plate, dishwasher, electric kettle. Two bathrooms, one with washing machine, dryer. There is a safe deposit box.